Call for volunteers: test phase for our CML adherence app starting soon. Technically-adept and less experienced users wanted! CML Horizons 2015: visit our photo gallery! "What´s in the news? ": share newspaper articles and reports related to generics and copy drugs! 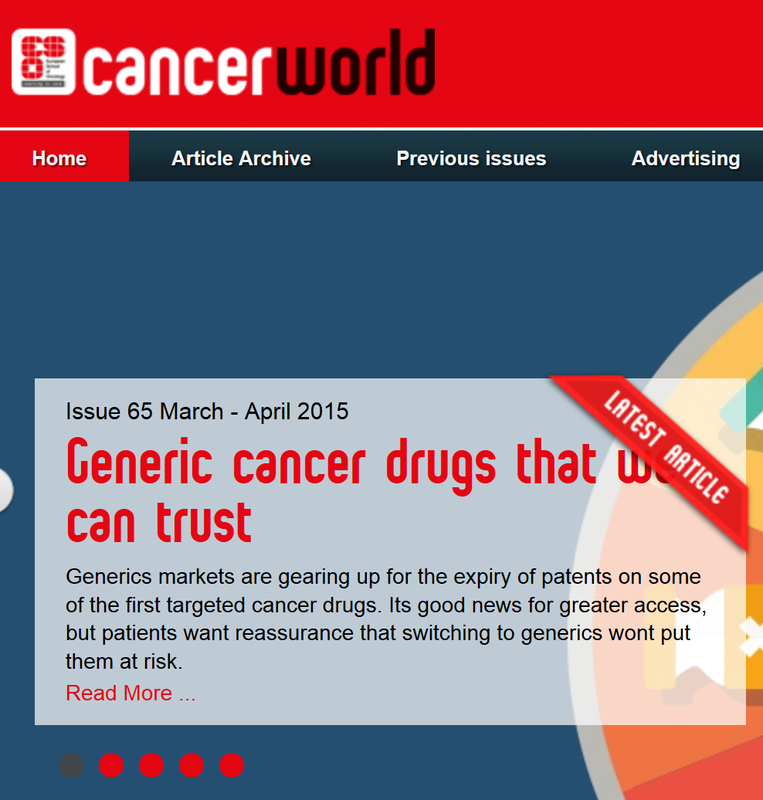 Two must-reads: CancerWorld articles on "Side effects of target treatments" and "Generic cancer drugs"
Read our CML Advocates Network Newsletter, July 2015 edition, here. Find our archive of earlier newsletters here. Subscribe to our E-Mail newsletter here. 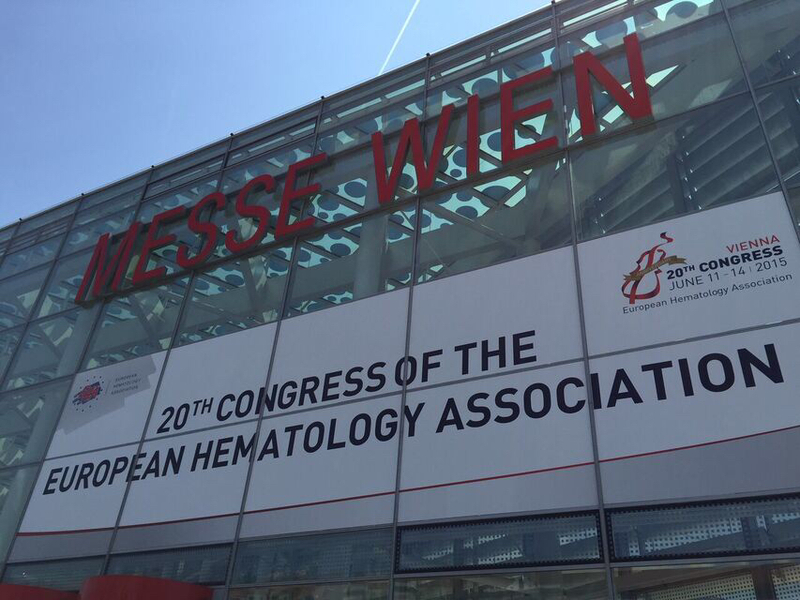 From 11-14 June 2015, the European Hematology Association's (EHA) Annual Congress opened its doors in Vienna, Austria. Again this year, the CML Advocates Network has been working closely with EHA to provide patient advocates with free congress registrations and exhibition booths. 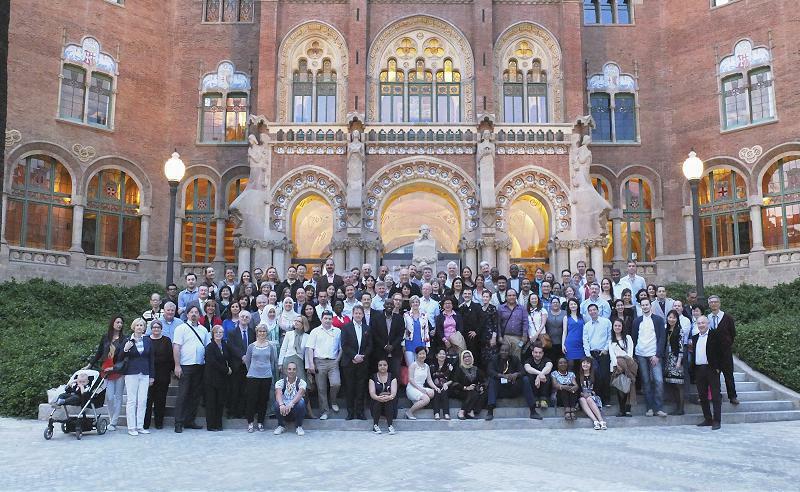 48 patient advocates from 37 hematological patient organizations attended the congress. Patient advocates are recognized by EHA as competent and reliable partners. Patient Advocacy sessions were again an integral part of EHA's annual congress program! PDFs of all three patient advocacy sessions are now available. Click on the respective presentation to download the slides. We are pleased to announce the launch of a new sub-section on our website: The menue item "What´s in the news? ", a sub-section of our "CML Generics" section, contains newspaper articles and reports related to generics and copy drugs in CML. This sub-section "lives" only if you make it grow! So please share all interesting and relevant articles that you come across with us! Please see the current list of articles here and share all articles related to CML generics and copy drugs that you come across! In September 2014, the CML Advocates Network published the international CML Book "Faces of Courage and Hope" an English-language book that illustrates the life of 16 CML patients from 15 countries. Welcome to our new members - our network grows to 102 organizations in 78 countries! Read our CML Advocates Network Newsletter, May 2015 edition, here. 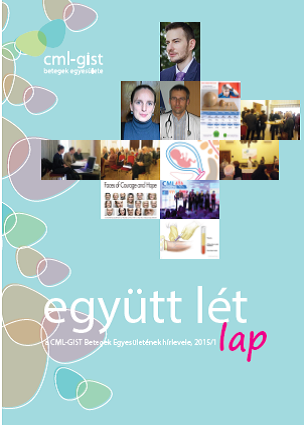 The Hungarian patient organization “CML-GIST Betegek Egyesülete", who is a member of the CML Advocates Network, has published two patient stories of our book "Faces of Courage and Hope" in their recent newsletter. The stories were translated into Hungarian language and were slightly shortened. See page 8-9 of the newsletter. If you are interested in incorporating selected stories from our book in your newsletters to both share the stories and promote our book, please send a short e-mail to informing which stories would be of particular interest. We will then support by requesting approvals by the photographer and the patients. More information on our International CML Book "Faces of Courage and Hope" can be found here. Please help us spread this wonderful book and its moving stories to CML patients worldwide! Video streams of all presentations will become available in the next 2 weeks. We hereby proudly welcome two new members to our network: Max´s Vie based in Vietnam and Max Miracle from Cambodia. The CML Advocates Network now counts a total of 102 member organisations in 78 countries worldwide! See the list of CML groups in the Network on our world map. The side effects of targeted drugs are poorly documented, and their impact on patients frequently seriously underestimated and undertreated. 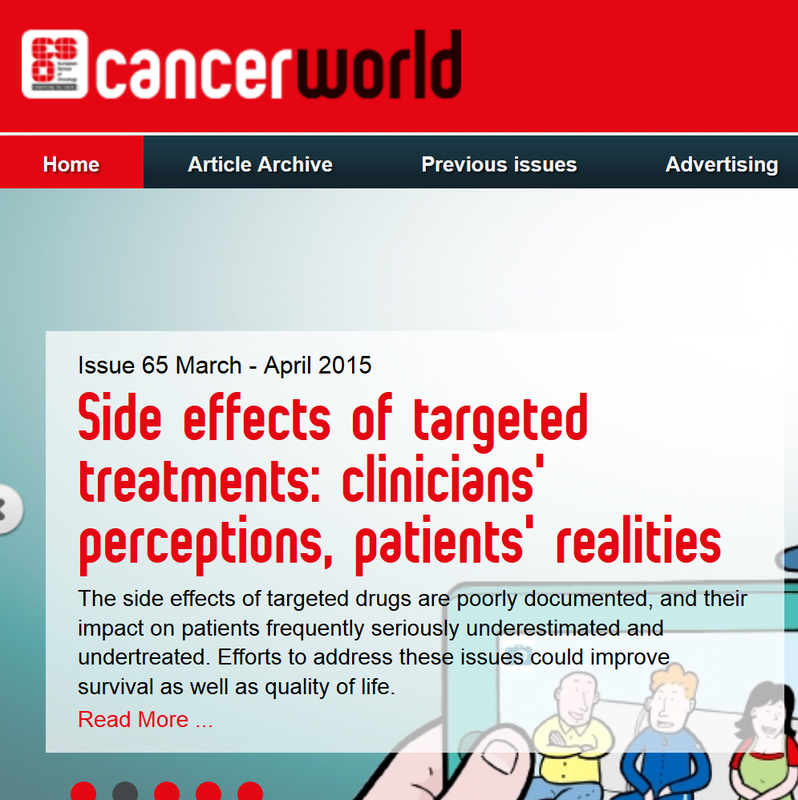 A new CancerWorld article covers this important issue. Our CML adherence study and the issue of side effects in CML treatment is covered in detail! Also covered: the Myeloma Patients Europe survey and the GIMEMA CML study on the different perceptions of doctors and patients on side effects. A must read! Free EHA congress registrations for representatives of patient organizations: Deadline 24 March 2015! This year's EHA Congress will be held 12-15 June 2015 in Vienna, Austria. Thanks to very patient-centric thinking, EHA continues to work closely with the patient community and is again offering a “Patient Advocacy Track” within the scientific program. A team of leading patient advocates is currently working on the sessions for the EHA Patient Advocacy track and making a great effort to cover topics of priority for patients across diseases that are – at the same time - attractive to hematologists. As in previous years, EHA is again providing 50 free congress registrations for leaders of hematology patient organizations to give patient advocates the opportunity to attend the EHA congress in Vienna. The free registrations are only available to representatives of patient organizations, and EHA is requiring them to attend our capacity building session (planned for Saturday afternoon). The registration allows access to the scientific congress, but will not cover travel or accommodation costs. If you are interested in a free registration, please reserve your free registration here. Deadline for free registrations is 24 March 2015! Please also note that the free registration are subject to confirmation by the EHA office - the CML Advocates Network just collects statements of interest on behalf of the patient community. For more information on the 20th EHA congress, see here. Welcome to our 100th member in the CML Advocates Network! Since its initiation in 2007, the CML Advocates Network has grown at an amazing pace. Since January 2015, 10 new organizations from 7 countries have joined the network! Our newest members are the "Indonesian CML & GIST Community (ELGEKA Indonesia)" and “Leucémie Espoir” from Mali. WELCOME! With this, we have now reached a total of 100 members based in 76 countries worldwide! See the list of CML groups in the Network on our world map.